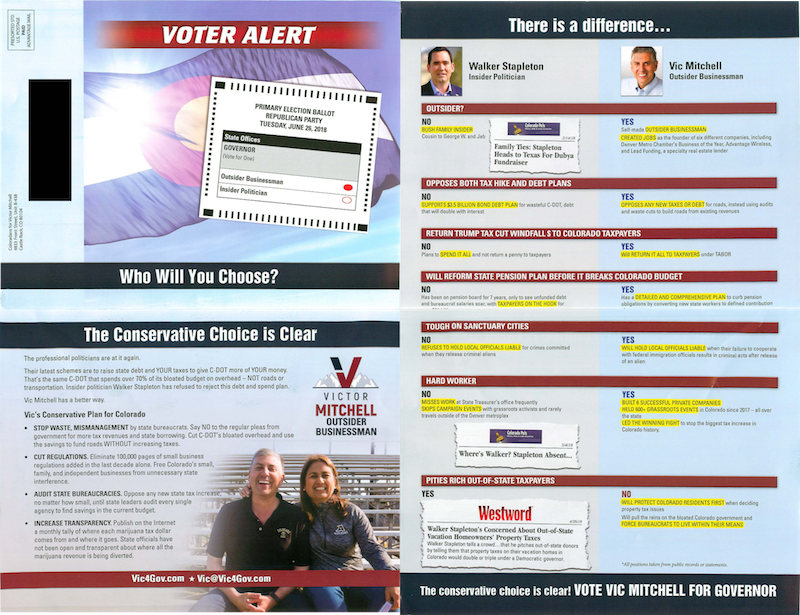 About the message: In this mailer, GOP businessman Victor Mitchell contrasts his positions with Republican Treasurer Walker Stapleton and urges voters to choose Mitchell in the four-way June 26 primary. The mailer criticizes Stapleton for inaction on the state's public employee retirement plan as state treasurer, his apparent absence from work as treasurer and his failure to show up at many events with other candidates. About the messenger: Victor Mitchell is a Castle Rock businessman who served in the Colorado House of Representatives for two years from 2007 through 2009. He runs Lead Funding, which loans money to developers. He finished second in the four-way GOP primary. The messenger's money: Mitchell largely self-funded his gubernatorial bid, loaning his campaign nearly $5 million.